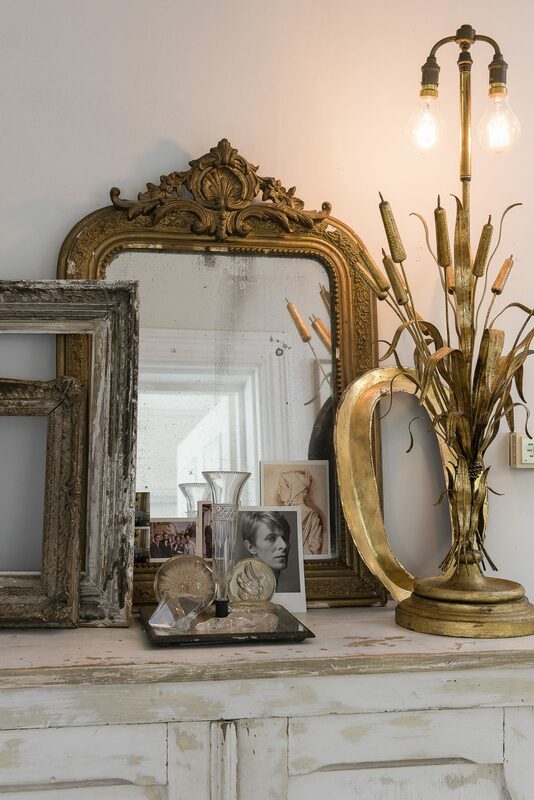 A textile conservator and an antique dealer combined to create a home where patina is prized. There is cold – as in chilly – and then there is cool. The Tunbridge Wells home of textile conservator Charlotte Casadéjus is definitely the latter. 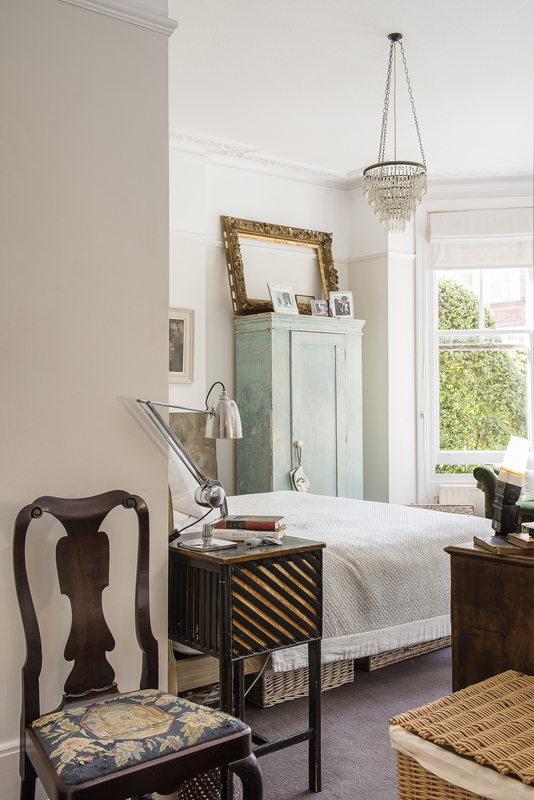 Whether it’s the fortuitous aspect of this wonderful Tunbridge Wells home, or the fabulous vintage French linens that Charlotte, who has been collecting and working with them since her 20s, has used throughout the three-bedroom flat she shares with her partner Streett Marburg and her teenage son, the effect is one of lightness and an elegant tranquillity. 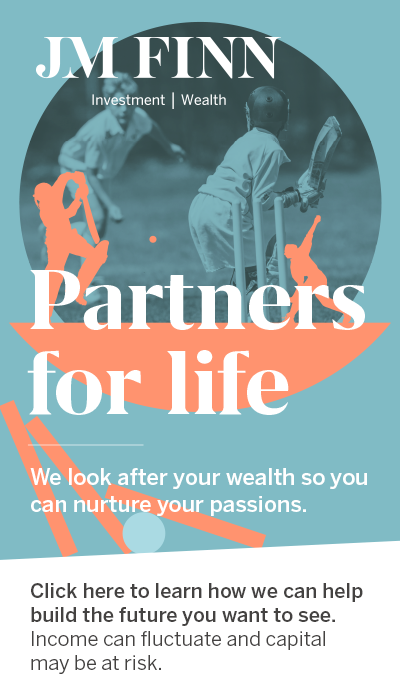 Located on the ground floor of a former Admiral’s home on a wide and leafy avenue, Charlotte moved into what was formerly her partner’s bachelor pad eight years ago. The pair had met at the Decorative Antiques and Textiles Fair in Battersea, where Tunbridge Wells-based Streett had been dealing fine English antiques. But love did eventually blossom and Charlotte, who had been based in the beating heart of London in Borough, was suddenly thrust into an entirely new life in leafy Tunbridge Wells. Luckily for Charlotte and Streett it was a coming together of two aesthetic sensibilities that immediately clicked. 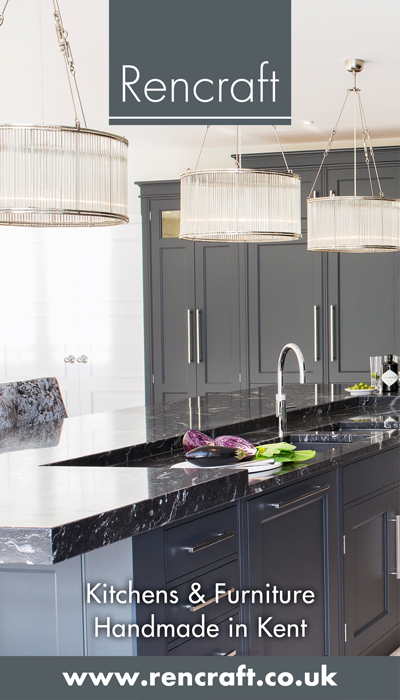 As well as creating a fabulous home, so good was the chemistry between them that the couple decided to combine their professional lives as well. They now work together on their business Streett Marburg (streettmarburg.co.uk) sourcing fabulous decorative furniture and accessories from around Europe, whilst Charlotte also works on the conservation of the antique textiles that the company sells. 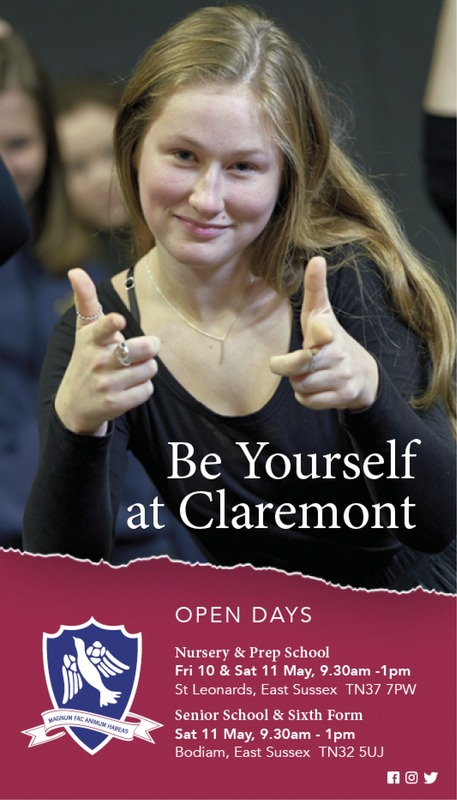 Charlotte explains that her coming into the business marked a change in style and focus for Streett, who up to that point had made a name for himself as a specialist in fine English antiques. “People don’t really want to buy a £50,000 English dining table any more,” explains Charlotte, “however spectacular the provenance. The trend has shifted. 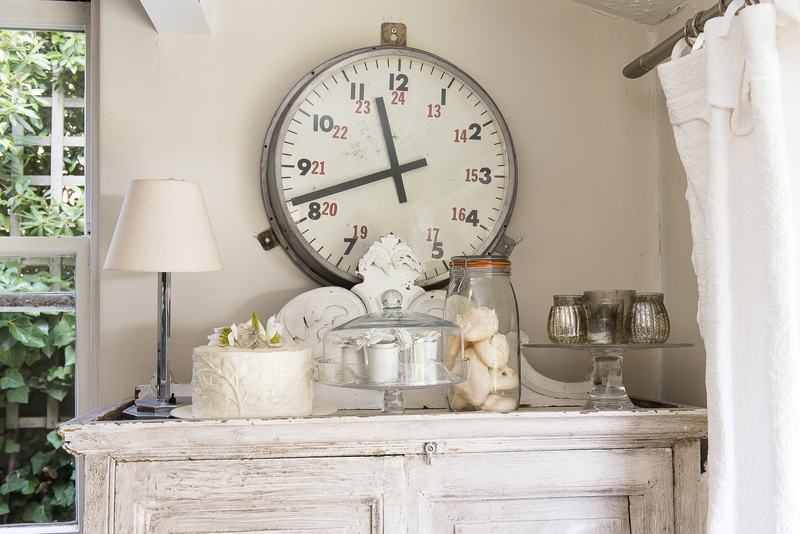 We all want to change the ‘look’ of our homes every few years, so the focus since I joined the business has been sourcing decorative antiques, which appeal to a faster and younger market, and more affordable too. 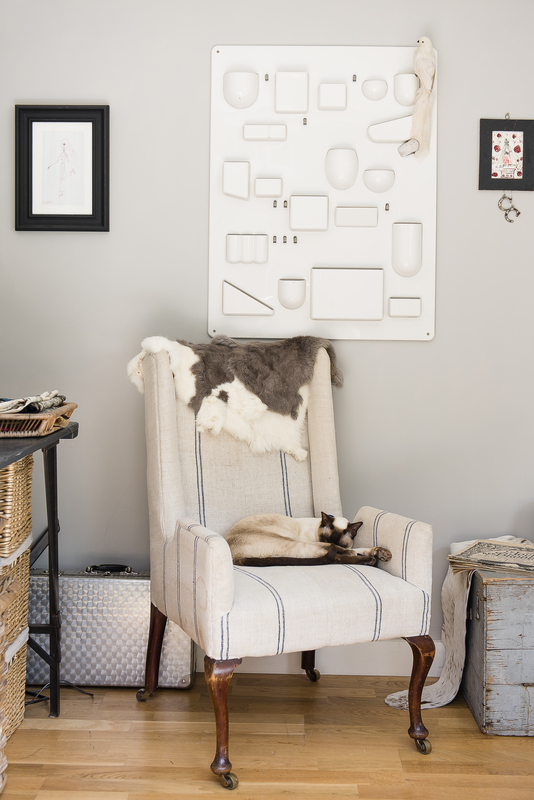 Just like their business, Streett and Charlotte’s home reflects this shift in interior trends. Each room has been beautifully curated to offer an entire picture, with pieces from the seventeenth to the twentieth century sitting happily side by side, artfully placed to bring out the best in each other. 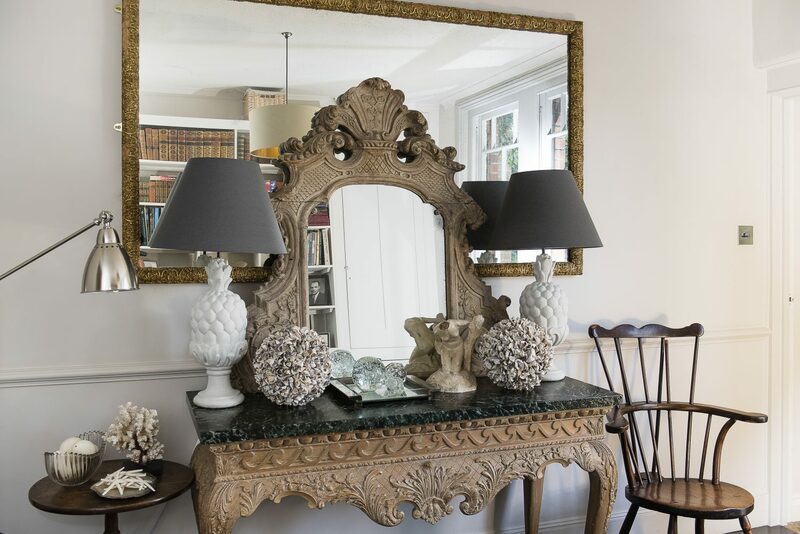 One of the few pieces left from Streett’s former collection is a stunning George III marble-topped table dating from c1780 and a rococo mirror that both still sit in his office. 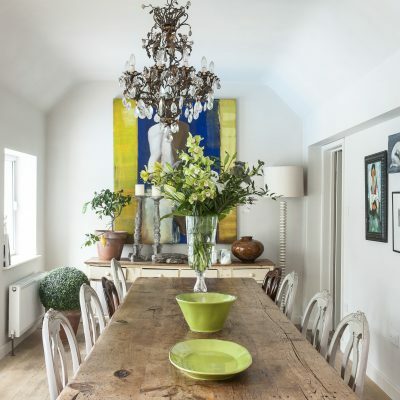 Charlotte has styled them with a pair of 20th century pineapple lamps and accessories sourced from the couple’s other favourite place – France. France is a theme that runs throughout their home. Charlotte had lived in France with her ex-husband and son for many years, and speaks fluent French, so it was no surprise that when she met Streett, they continued to visit and it is where they still source a large amount of their stock, even today. I asked Charlotte why she loved French vintage furniture and accessories so much, and why it is so different to the English look? Charlotte takes me on a tour of her flat, telling me about the wonderful pieces the couple have acquired, some of which are from their private collection and others that are from their business. 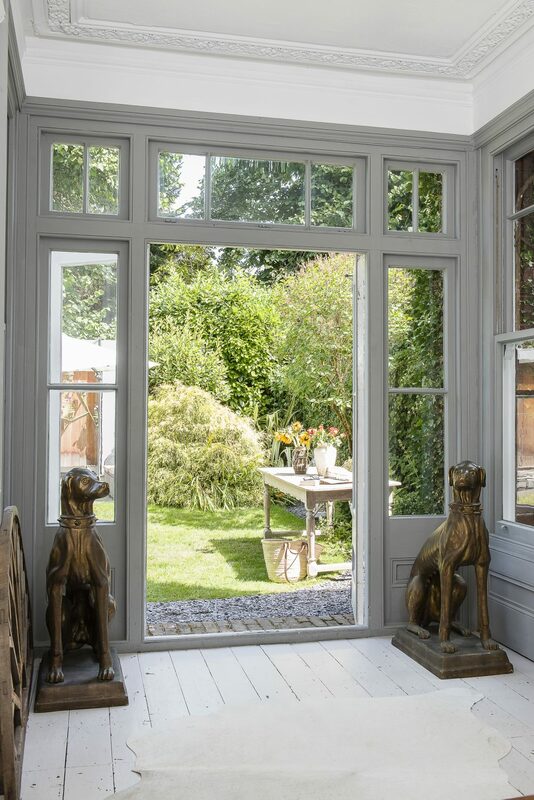 In their sitting room are two life-size dog statues, either side of the French doors. 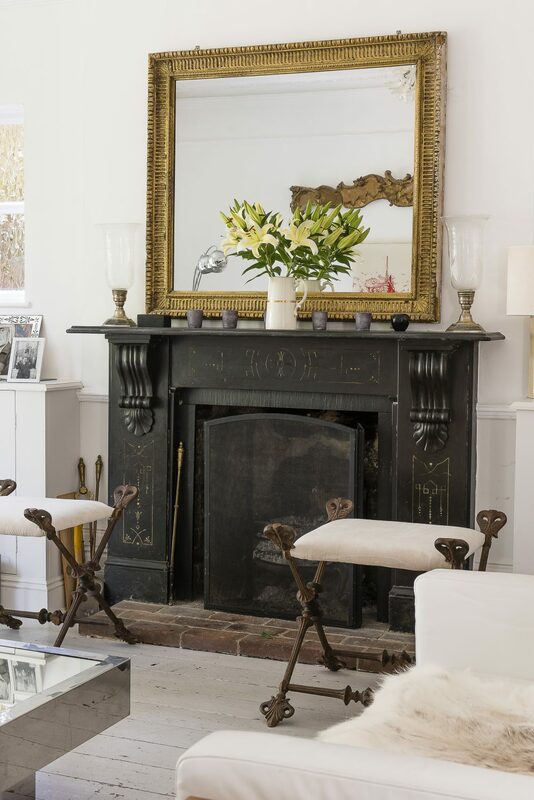 A pair of cast iron Napoleon III stools sit by the fireplace. Next to them is a rather fabulous mirrored coffee table, all of which are available to purchase. Having a veritable sweet shop of unique furniture and accessories must be like heaven. I ask Charlotte if it is not also a pleasure tinged with sadness as she has to say goodbye to treasured items as each piece goes off to a new home. She smiles as we look at a stunning antique Chinese cabinet that will soon, no doubt, depart for a new life. Perhaps it’s not so bad. Business is business, after all, and as one piece goes another item can take its place. 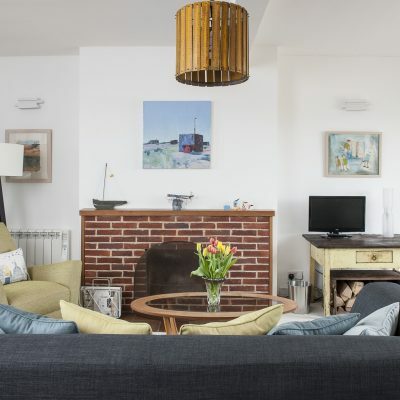 Throughout the apartment Charlotte and Streett have opted for a muted colour palette of whites and greys, again inspired by France. For Charlotte, especially, the look is all about texture and detail and less about bright colours. 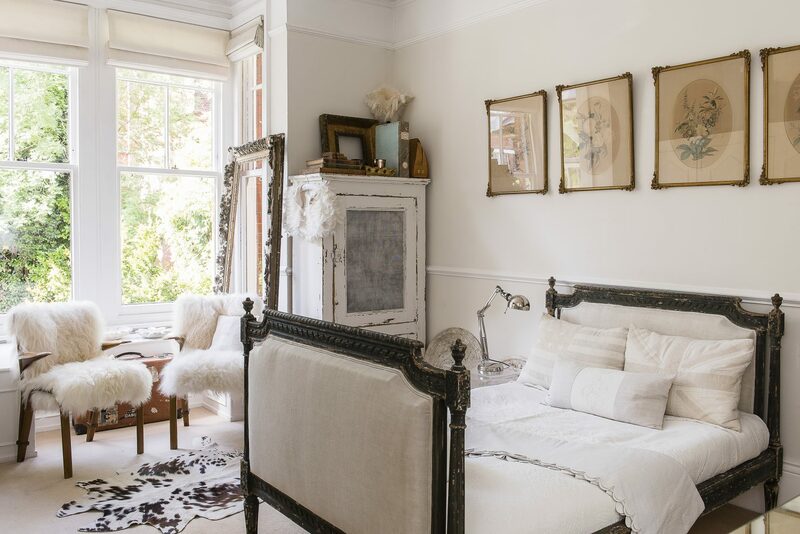 Whether the fluffy tactile Icelandic sheepskin upholstery on a pair of Steiner chairs in the guest bedroom or the Venini glass chandelier in the living room or the tiny alabaster flowers in the sitting room, there is something to arrest the eye throughout the couple’s stylish home. Some of the very few pops of colour can be found in their collection of contemporary art. 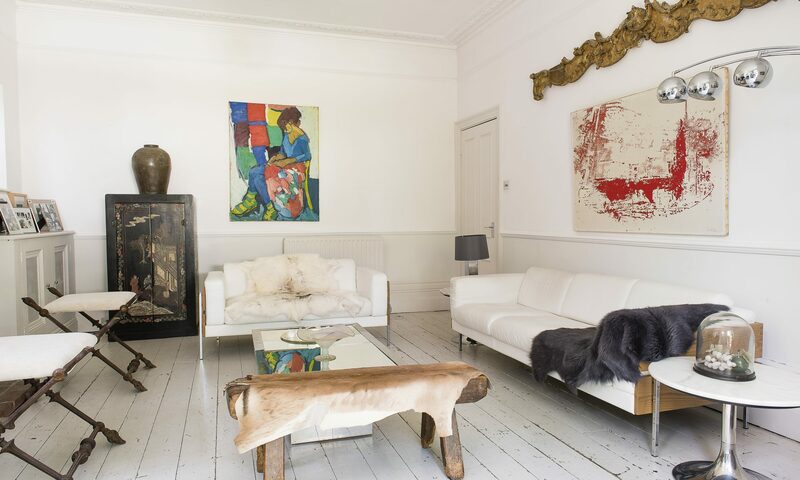 But just as with their furniture, modern pieces of abstract art are allowed to sit alongside more classical pieces – and it all just seems to work. 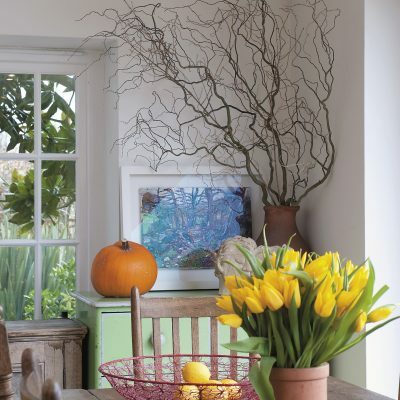 Back in the large north-facing sitting room, which overlooks the flat’s green and abundant garden, Charlotte’s clever understanding of colour and texture is employed once again to pull as much light as possible into the room. 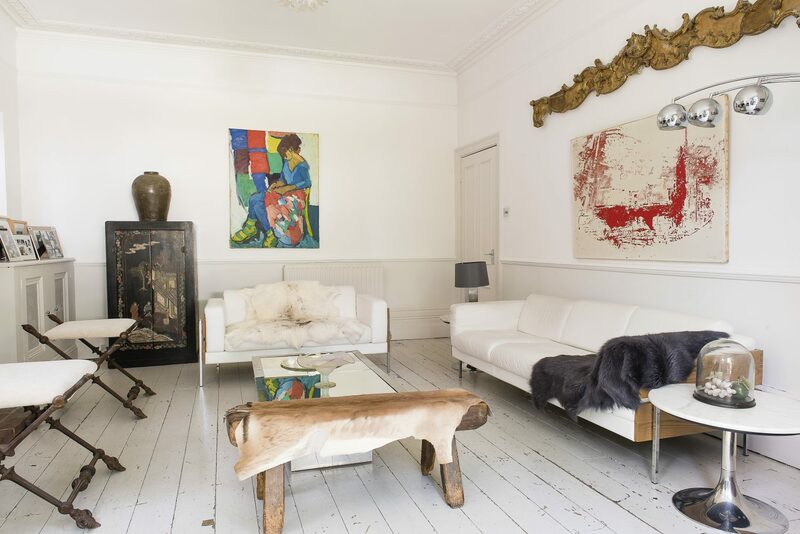 The white painted floorboards and tonal grey and white walls and windows play host to two 20th century white leather sofas – a Robin Day design for Habitat. Chrome lights from the 1960s bounce all available light around the room to wonderful effect. It’s bright, tranquil and feels incredibly spacious. In Charlotte and Streett’s bedroom, on the other side of the apartment, the wonderful high ceilings of the original building are exaggerated yet further by a triple bay window which overlooks the building’s leafy front garden. 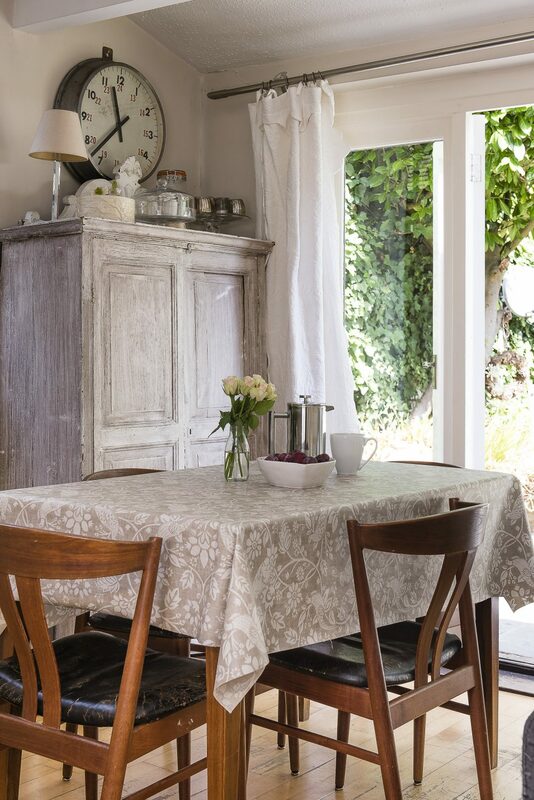 Flooded with light, Charlotte has used her crisp vintage French linen collection in Roman blinds that she hand-made for the window dressing – a technique she has repeated throughout the house, wherever she required blinds. The upholstered bed by Loaf is decorated with more of Charlotte’s cushions, giving a sense of continuation but also of delicacy. On the wall is a piece of contemporary art that Streett gave Charlotte for her birthday by artist Andrew Douglas-Forbes and on the floor are two large panels, abstract portraits from the 1960s. Above the bed is a French mortuaire – a beaded funeral wreath. “I know it’s macabre but I love it. Time moves on and for me, these pieces are just beautiful sculptures,” says Charlotte. The guest room is also a delight. The bed, an original Louis XVI piece, has been reupholstered in antique linen and is also available to buy. The couple made a choice not to re-paint it, letting over two hundred years of use reveal itself. 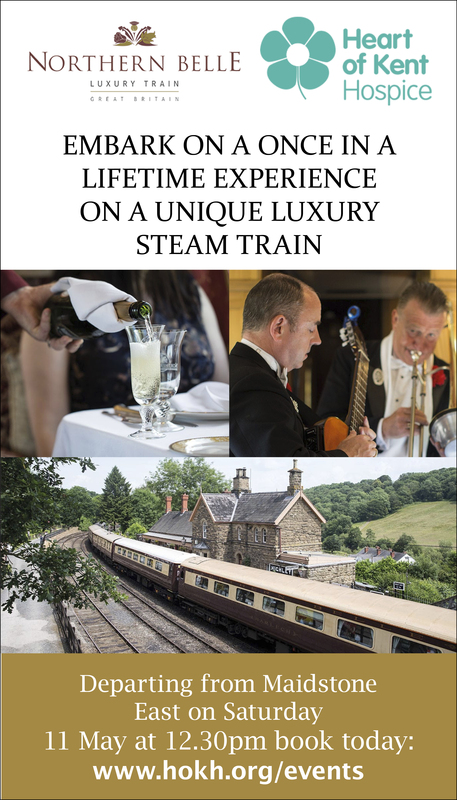 Forget counting sheep, guests can simply count the many lives that have lived between the wooden foot and head panels of this remarkable piece of social history and wonder what might have passed before them. Streett and Charlotte have managed to create a home that is stylish and airy, with their intelligent use of light and space but also with their innate sense of detail and character. 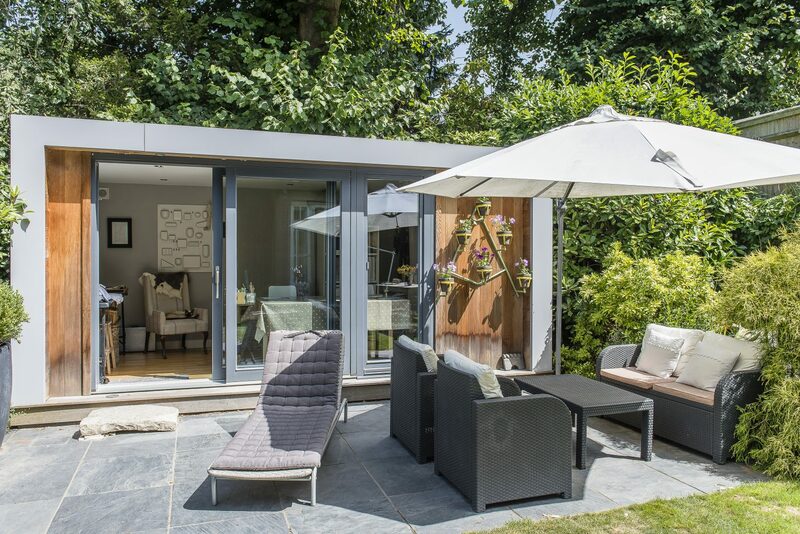 This feeling of an oasis, right in the centre of town, is continued through into their magical garden which, although surrounded by neighbours on all sides, has managed to remain secluded and private, surrounded by high walls of greenery on all sides. As with the rest of the house, so too within the garden, pieces of period furniture have been beautifully curated. 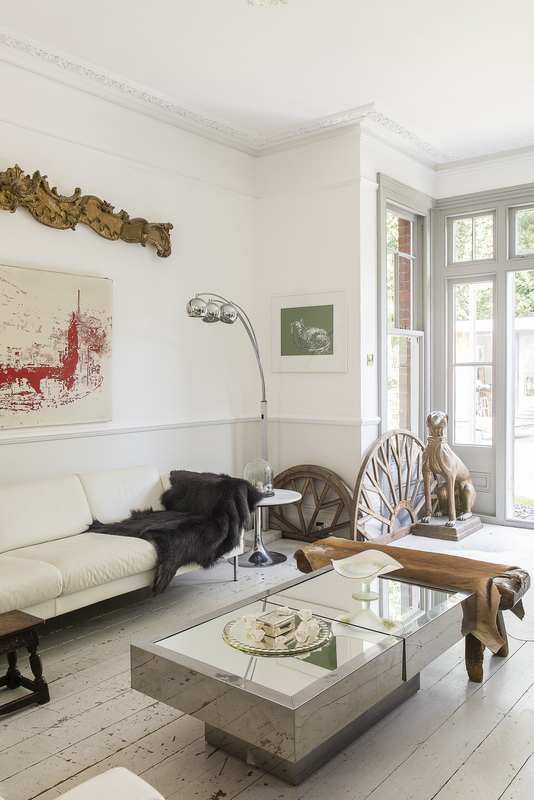 Side-by-side, sitting casually by the French doors, are a pair of utterly beautiful 19th century Arras cast iron benches. And she is right. The combination of Streett’s eye for historical detail and Charlotte’s for colour, texture and quirky design, has come together in a family home that is an oasis of elegance and somewhere we could all dream of spending a long lazy Sunday lunch, thoroughly enjoying ourselves.